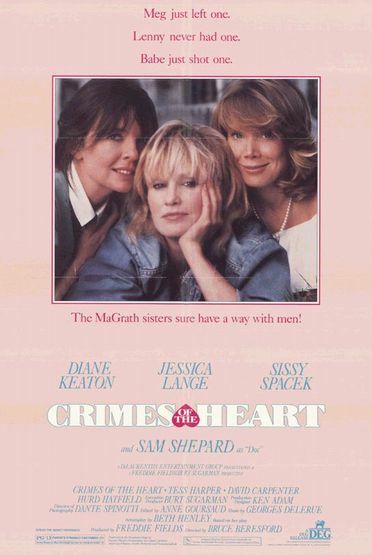 Three grown sisters — Meg (Jessica Lange), Lenny (Diane Keaton), and Babe (Sissy Spacek) — reunite in their Southern childhood home when Babe is accused of shooting her husband (Beeson Carroll). Crimes of the Heart — directed by Bruce Beresford and starring a triumvirate of Oscar-winning actresses — is, unfortunately, a disappointment. Pulitzer Prize winner Beth Henley adapted her monologue-saturated, flashback-heavy play for the screen, but her attempts to open up the stage-bound settings do little to mask the fact that her characters are basically talking at each other the entire time. And Henley’s unique strain of Southern gothic humor — Spacek’s overt lack of guilt for shooting her husband; Keaton’s “shrunken ovary”; their mother’s odd “double suicide” — ultimately doesn’t work within the context of a realistic film. With that said, both Spacek and Lange give wonderful performances as damaged sisters coping in their own dysfunctional ways. Keaton, unfortunately, fares much worse, coming across — as noted by Paul Attanasio of the Washington Post — as “a parody of herself, all nervous gestures, daffy glances and Annie Hall tics.” Sam Shepard and Tess Harper (the latter nominated for a Best Supporting Actress Oscar) are fine in minor roles, but don’t have enough screentime to make much of an impression. And, in the end, no amount of worthy acting can redeem what is essentially a flawed film. No. Despite its Oscar-nominated performances, this isn’t must-see viewing. Since I’m rather in complete agreement with the assessment here, I don’t think I’d have much to add. Nor do I think I’d want to watch it again to refresh my memory. Seems to me that, at the time Peary’s book was being put together, Henley was something of a ‘flavor of the month’ – what with ‘Crimes…’ getting the attention and praise that it did as a play. But the film version does disappoint – even with the pedigree of its cast and director.